Konad started an insane trend in nail art with their revolutionary nail art stamping plates. Girls fawned over the designs and doled out handfuls of cash to procure the plates. Then we met Bundle Monster, who offered the same designs plus additional patterns for a much cheaper price. The nail blogs filled up with the popular patterns, and we all patiently awaited the dawn of a new nail era. Well, your wait is over. I've found, tried, and adored a new series of plates, brought to you by Red Angel. I'll save the post of the image I used for tomorrow, but I wanted to whet your appetites and get you excited about these new designs. I did a search on Amazon for "nail stamping plates" and after sifting through the Bundle Monsters, Konads and Mash plates, saw this lonely little ad for a 21 piece set. The thumbnail picture you're shown in the search results doesn't exactly scream "Buy me!" with the pixelated, sharp contrast between hot pink and taxi cab yellow, but click further ladies, and marvel in the wonders of the designs. 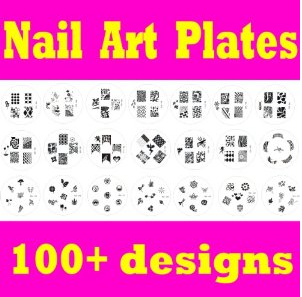 With 13 of the 21 plates sporting full nail designs, I knew right away this was something I wanted to investigate. But no reviews? Not a single star given out for these? Well, I figured for $11.99 before shipping, I couldn't be too disappointed if they didn't meet my expectations. The package arrived today during lunch, and I couldn't stop thinking about which pattern I wanted to try when I got home later after work. Even when I did arrive home, I was overwhelmed with choices I adored that finally picking one came down to a game of eeny, meeny, miny, moe. I'll tell you this much...I'm thrilled. The designs aren't for everyone, and by no means can be called "classic." But their possibilities are endless, as you'll see tomorrow. Sleep well ladies, and don't fret. Come tomorrow, you won't be disappointed. Damn-you should NEVER show me new plates-I already went and bought these and saw a new MASH and Shany sets on Amazon as well-you are costing me money!!! @Fingers :D SORRY! You won't be disappointed though. They're much different than the sets I've seen. MASH seems to have a lot of dupes of Konad, and Shany looks exactly like Bundle Monster. These I have never seen before (except for a few individual designs). Hey...you could always add it to a Christmas list! Ofcourse I had to look for myself, and damn those plates look good!! Can you please let us know!? The full-size designs on the plates are larger than the first Bundle Monster set. They align more with the second set and Konads. One plate has designs that are shaped like half moons, so they won't fit anyone's full nails, but that is intentional. I actually used one of those in tomorrow's post!